I’m on “vacation” right now from my job at Codename One, so I’m taking some time to work on personal projects for the first time in a while. On the second day of my “personal project” time, I received an email offering me the domain name OCR.net. I was interested in this domain for SEO purposes of PDF OCR X, an app I developed for Mac and Windows for converting scanned PDFs and images into text or searchable PDFs using OCR. Though it cost me a small fortune, I decided to buy the domain. Now, I could have just redirected this domain to the PDF OCR X website, but I thought it might be cool to create an online version so that OCR.net could function as a self-contained OCR web app. Converting PDF OCR X into a web app took a bit of work. In addition to setting up a public-facing web site, I needed to modify the app so that it would run as a daemon, rather than a “drag-and-drop” desktop app. I built a job dispatching system using Xataface which runs on the OCR.net server itself. The PDF OCR X “daemon” is then run on a Mac server, elsewhere (currently in my basement), but the architecture is such that I can fire up as many “PDF OCR X” boxes as I like and they will request jobs from the central dispatcher as they become available. This way it is easy to scale the service. I wanted a clean, modern user interface for the web app. And it needed to look good on mobile as well as desktop. I found this nice design by ajlkn that felt right. It is minimal and clean. 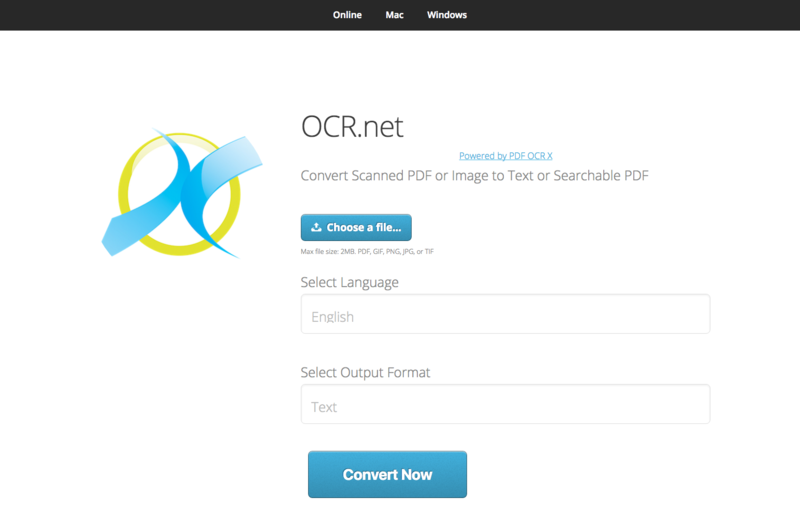 PDF OCR X has always only been a desktop application (Mac or Windows). I hadn’t paid much attention to mobile. However, with this new web-based UI, it is actually quite useful as a mobile app in itself. On my iPhone I tested it out by taking some snapshots of some documents on my desk, and it converted them with pretty good accuracy. Adding OCR.net to my home screen allows me to use it just like a first class iOS application. Try it out. Share it with your friends. Add it to your phone’s home screen. Use it.